Insanely clever, funny, and a political thriller: not something from the new release shelf, but rather Mozart’s Don Giovanni at San Francisco’s War Memorial Opera House. Excellent stage direction and minimal sets put the spotlight on great singing, strong acting, sublime music and one of the best yarns in over two hundred years. Mozart told truth to power, as the Quakers say, in his collaboration with librettist Lorenzo da Ponte, based on the myth of Don Juan. But in their hands the charming and scandalous womanizer is also recast as abusing the powers of nobility. Written ten years after the American Revolution and two years before the storming of the Bastille and the French Revolution, the opera’s themes reflected the political upheavals across Europe, as people increasingly questioned the absolute authority of the ruling class. And it was so clearly political that Vienna was reluctant to mount it. Mozart conducted the premiere in more liberal Prague. Don Giovanni, often described as a pinnacle of classical opera, is a perennial favorite of opera houses. Several versions have recently appeared in the Bay Area, most notably starring Dmitri Hvorostovsky and Mariusz Kwiecken at the SF Opera and Eugene Brancoveanu at Berkeley Opera. Each production emphasized a different perspective, and each Giovanni gave it his own stamp. When the golden-tongued and boyish Hvorostovsky swung on a rope across the stage with his shirt unbuttoned, women screamed. Kwiecken displayed a very human rogue, set against a sinister set that detractors described as “Euro trash.” In Berkeley’s modern take (including cell phones and sushi! ), Brancoveanu was both playful and compellingly immature, riding his demons all the way to hell. At Saturday night’s opening, American baritone Lucas Meachem performed the bad-boy role with suave gestures and the impatience of those born to privilege. His delivery was more chilling than human. His comedic servant, Leporello, created dramatic tension through contrast, much as Shakespeare employed low characters as a foil to a more serious storyline. In this, celebrated Italian bass Marco Vinco nearly stole the stage with pathos and pratfalls. His gruff delivery and physicality were earmarks of commedia dell-arte training, and indeed the entire production was splendidly physical. Besides Vinco’s sly staggers and Meachem’s splendid poses, Kate Lindsey was a total knockout as Zerlina, the bride with sparkle and sauce. A true triple threat, Lindsey was required not only to act, but also to dance as she sang—and to sometimes sing while lying on her back—and the purity of her voice easily floated through the opera house. As she sang “La ci darem la mano” with Don Giovanni, she was more than believable. And her “Batti, batti o bel Masetto” (Beat me, beat me, dear Masetto) was both endearingly innocent and exquisitely naughty. The sets were minimal, relying on a forest of mirrors that rose or settled to define the action. These 300-pound rectangles cleverly referenced the interior iconography of the characters, avoiding the discrepancy between eighteenth century Italy and timeless human elements. But they also gave a severe cast to the production, one that bordered on black box Theater. The costumes, on the other hand, embraced that dichotomy with gorgeous retro ensembles topped with rapiers and sunglasses. The acting and sets seldom upstaged the singing and music, which included one of the best casts I have heard and the glorious San Francisco Opera Orchestra conducted by Nicola Luisotti. While the music occasionally overwhelmed a lighter singer, none would deny Mozart his due. Much like those Golden Oldies commercials on late night TV, Don Giovanni includes a laundry list of opera’s greatest arias—“Madamina!” sung by Vinco, “La ci darem la mano,” Meachem’s duet of seduction with Lindsey, “Dalla sua pace,” and “Il mio tesoro,” both beautifully sung by American tenor Shawn Mathey as Don Ottavio, and Meachem’s blistering “Finch’han dal vino,” and sweetly plaintive “Deh vieni alla finestra,” one of the high points of the opera and a glimpse into the heart of a complex villain. Soprano Ellie Dehn was a strong Donna Anna, with a moving “Non mi dir,” and Serena Farnocchia embodied the spurned Donna Elvira with supple delivery and gorgeous undertones. This opera also contains a quartet and sextet—some of the finest ensemble writing in the biz. In this cast, fine blend surpassed individual sound, as each soloist toned down their vibratos for the group harmonies. Believe me, that egoless purity of sound is a rarity on the stage! Capping off the production with hellfire and vocal thunder was Morris Robinson, whose spine-chilling bass evoked the murdered Commendatore—returning as a statue to exact vengeance! Mozart’s admonition to unfettered power was timely when this country was founded, and remains timely today. If Mozart were contemporary, would his opera—or rock opera—feature the unscrupulous Dons of Wall Street? And would he still feel it necessary to call on divine intervention to achieve economic equity? Neither genius nor corruption seems to have changed in the last two and a quarter centuries. This great cast continues Nov. 2, 5 and 10 at San Francisco’s War Memorial Opera House. The conclusion of the opera season is fast upon us, with Handel’s Xerxes and Bizet’s Carmen beginning in early November. More information at www.sfopera.com. Photo top, Kate Lindsey as Zerlina. 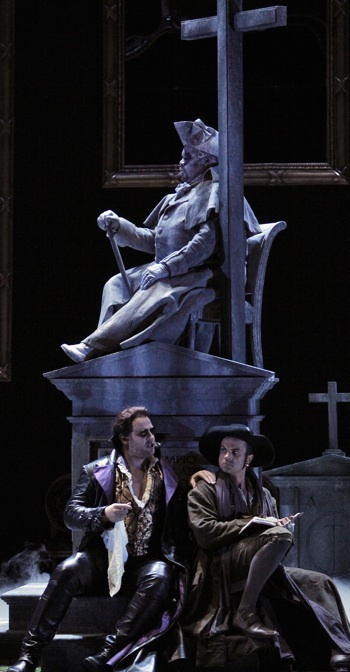 Photo bottom, Lucas Meachem as Don Giovanni and Marco Vinco as Leporello with Morris Robinson as the statue of the Commendatore. Photos by Cory Weaver.